Although he was fired last week after a review of his position by White House Chief of Staff John Kelly and has now gone back to his role with far-right media, during his time in office Bannon also lobbied aggressively for Trump to keep his campaign promise and move the US embassy from Tel Aviv to Jerusalem. Moreover, he is said to have pushed the US President’s son-in-law and senior adviser Jared Kushner to adopt a tougher stance toward the PA.
Kushner will be arriving in Israel later this week at the head of an American delegationscheduled to meet Israeli and Palestinian officials. BETHLEHEM (Ma’an) — Two human rights organizations released a joint statement on Monday rejecting Israeli plans to construct a passenger train line between the Negev and the Israeli city of Arad in southern Israel, saying the plans would “destroy the lives” of some 50,000 Palestinian Bedouins residing in villages near the proposed train line. Israeli NGO Bimkom and Palestinian-run rights group Adalah filed an objection to the proposed Beer Sheva-Arad train line on Aug.10 on behalf of the Regional Council of Unrecognized Villages in the Naqab (Negev) and other Bedouin villages, the groups said in the statement, demanding that the Southern District Planning and Building Committee explore other alternatives to the planned route of the train line. The groups reported that the train route would “gravely violate the rights of Bedouin citizens in the area,” including causing mass land appropriation, home demolitions, and state-enforced evictions of Bedouin along the train’s route. According to the statement, the current plan would seize 4,700 dunams (1,160 acres) of lands in the Negev for the construction of the tracks, stations, access roads, and other planned infrastructure. The drafters of the plan had ignored the potential impact the train line’s construction would have on tens of thousands of Bedouin residing in the villages of al-Furaa, al-Kseifeh, and unrecognized villages in the area, including al-Buhireh, al-Mazraa, al-Katmaat, and al-Azeh, the groups said. The proposed rail line would “destroy the lives of hundreds of families, their homes, their economic investments, and harm their societal and tribal lifestyles,” the statement said. Unrecognized Bedouin villages in the Negev face routine Israeli demolitions and attempts to forcibly expel the populations from the area and transfer them to government townships in order to make room for planned Jewish neighborhoods. According to the Association for Civil Rights in Israel (ACRI), more than half of the approximately 160,000 Negev Bedouins reside in unrecognized villages, which Israel has refused to provide with basic services, such as running water, health care, electricity, and education. 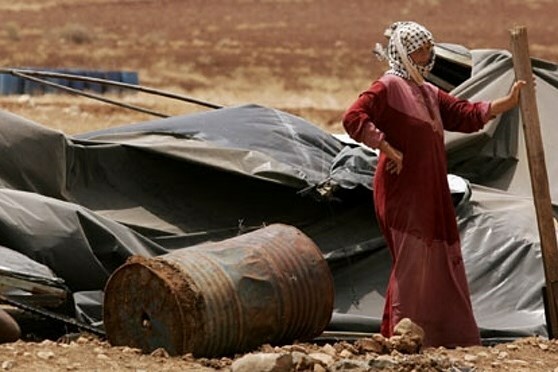 However, Bedouin villages that are officially recognized by the Israeli state continue to face Israeli demolitions owing to Israel’s discriminatory zoning and planning regime, and the overlap of some Bedouin villages on lands designated for planned Jewish towns. Former UN Special Rapporteur on the Rights of Indigenous Peoples James Anaya released a scathing report on the treatment of the Bedouin in the Negev back in 2011 — shortly before the Israeli cabinet approved plans to relocate some 30,000 Bedouins from 13 unrecognized villages to government-approved townships. 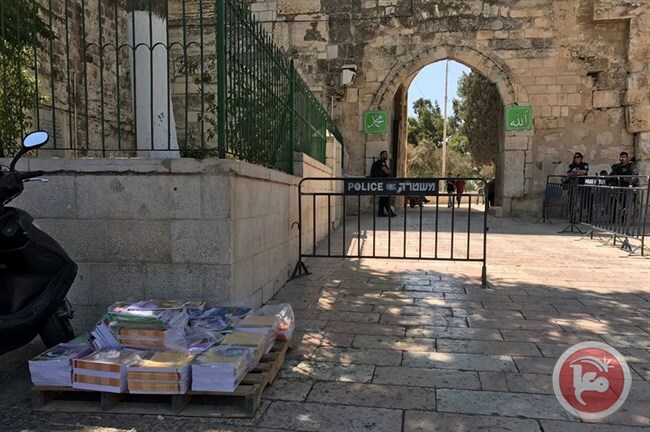 JERUSALEM (Ma’an) — Israeli police stationed at the Lions’ Gate entrance to the Al-Aqsa Mosque compound in occupied East Jerusalem prevented textbooks from being delivered to Palestinian schools located inside the walled holy site on Tuesday, a day before the first day of school. Sabri highlighted the it was not the first time Israeli authorities have restricted educational materials from entering Al-Aqsa. She said that just last week, Israeli forces prevented a private car from delivering a scanner to girls’ school, forcing children to roll it through on a wheelchair. She noted that Israeli police also prevented standard A4 paper from being delivered to the school for a two-week period last year. She said that Israeli forces confiscated electronic equipment from the school during the closure. Back in May, the Israeli security cabinet advanced a plan pushed forward by Israel’s far-right Minister of Education Naftali Bennett to incentivize Palestinian schools in East Jerusalem to switch to the Israeli curriculum by denying the schools that teach the Palestinian textbooks financial subsidies while granting those that teach the Israeli curriculum hefty portions of financial assistance. Palestinians say Israeli textbooks distort and misrepresent Palestinian history and culture, and the PA has described Bennett’s plan as part of an Israeli campaign to “Judaize” Jerusalem by threatening the Arab and Islamic heritage of the holy city marginalizing Palestinian Jerusalemites. 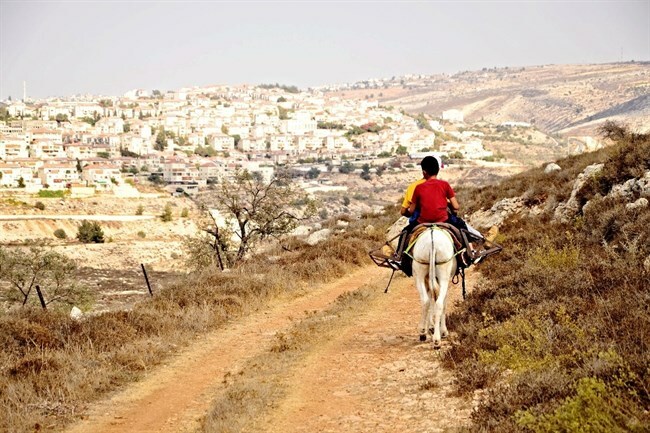 The Regularization law, passed by the Israeli parliament in February, states that any settlements built in the occupied West Bank “in good faith” — without knowledge that the land upon which it was built was privately owned by Palestinians — could be officially recognized by Israel pending minimal proof of governmental support in its establishment and some form of compensation to the Palestinian landowners. Israeli NGO Peace Now said in a statement on Monday that in response to the petitions — one of which was submitted by Peace Now and fellow rights groups Yesh Din and ACRI — the government justified the law by saying that the Palestinian landowners would receive monetary compensation. The state of Israel responded to arguments that imposing laws in the occupied territory was unjustified, due to the fact that Palestinians in the West Bank cannot vote for the Knesset, saying the issue was “irrelevant, since Palestinians also do not vote for the Military Commander who is enacting laws in the West Bank,” ACRI reported. Ramallah– Palestinian President Mahmoud Abbas said that since President Donald Trump’s election in November 2016, he had held over 20 meetings with US officials, yet still had little idea what their plans for peace negotiations were. Abbas told parliamentarians from Meretz party visiting Ramallah on Sunday that the entire Trump administration is in “chaos,” and indicated that the White House disarray was affecting peace efforts. “I don’t even know how they are dealing with us, because his entire administration is in chaos,” Abbas told the delegation. He said that each time they reiterate their commitment to a two-state solution and the stop to settlement building, adding that he urged them to tell Prime Minister Benjamin Netanyahu that, but they refrain. It is impossible to know what Trump and his team are planning, according to Abbas, and he doesn’t know to what extent this will be reflected in the results of the upcoming visit of the US delegation, part of Trump’s effort to restart the peace process. Abbas’ comments came as Trump is set to send three top aides to the region in an attempt to relaunch peace efforts. Asharq Al-Awsat newspaper had previously published reports about the Palestinian growing anger with the US administration. Trump’s senior adviser and son-in-law Jared Kushner, Special Envoy for International Negotiations Jason Greenblatt, and Deputy National Security Adviser for Strategy Dina Powell will all head to the Middle East, according to the White House, and will begin a lengthy tour in the Middle East where they will meet leaders from Saudi Arabia, UAE, Qatar, Jordan, Egypt, Israel and the Palestinian Authority. The US delegation is expected to pressure for the launch of real negotiations between Palestine and Israel and will also discuss the possibility of regional peace. Last negotiations between Palestinians and Israelis were held in March 2014 after nine months of US-sponsored talks. Palestinians relied on the new US president’s capabilities of sponsoring negotiations and they requested that they begin from where they reached with former Israeli Prime Minister Ehud Olmert focusing on borders and that it has to be limited by a timetable with guarantees to end the occupation. They also want Israel to commit to stopping settlements and to release detainees. But, after series of Palestinian-US negotiations, Palestinian officials realized that Washington is more biased to Israelis. A top official told Asharq Al-Awsat newspaper that this prompted Abbas to reject meeting US Envoy Greenblatt. Abbas told the Israeli group that he intends to ask Kushner again to have the White House express its commitment to a two-state solution and to demand a halt to settlement construction. Abbas noted that the Palestinian Authority recently approached Israel, offering to resume some kind of security cooperation, but Israel has not responded to the offer. Security cooperation between the two states had been suspended following al-Aqsa Mosque crisis on July 21. 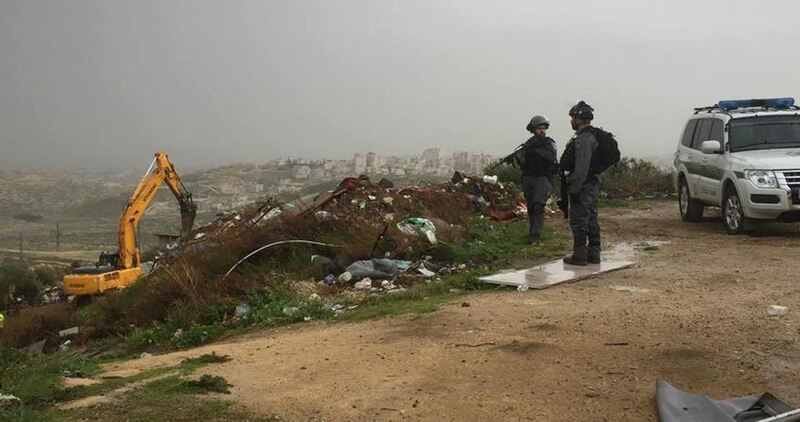 Despite the suspension in security coordination, Abbas instructed Palestinian security forces to increase surveillance of individuals who might be liable to carry out terrorist attacks on the Mount, and did so to prevent another clash that would turn the conflict into a religious one. The president also said that Palestinian security forces briefed the Trump administration on all the steps they take in the war against terrorism. Member of the Executive Committee of the Palestine Liberation Organization (PLO) Ahmed Majdalani said Monday that there is no meaning for any US effort unless it focused on the two-state solution and end of settlements establishment. Speaking to Voice of Palestine radio, Majdalani said the US administration’s peace efforts focus on minor issues rather than the major ones and therefore there are no signs of progress in the Palestinian-Israeli peace process. The top official explained that the efforts should focus on the main issue, and not on minor secondary ones, and that is how to end the Israeli occupation of Palestine based on international resolutions. “There are no signs that the US delegation’s visit to Palestine scheduled for the end of the month is going to have any breakthrough in the peace process deadlocked since April 2015,” he told the Radio. Majdalani warned that Palestinian cause is not a priority issue to the US administration which focuses its efforts on issues of China, Iran, Russia and North Korea. Informed sources told Asharq Al-Awsat that connections are stopped between both parties except in urgent or humanitarian cases. Netanyahu aide told Reuters that the reported remarks are simply incorrect. The aide, who spoke on condition of anonymity, declined to elaborate, citing policy of not publishing details on security contacts with the Palestinians. 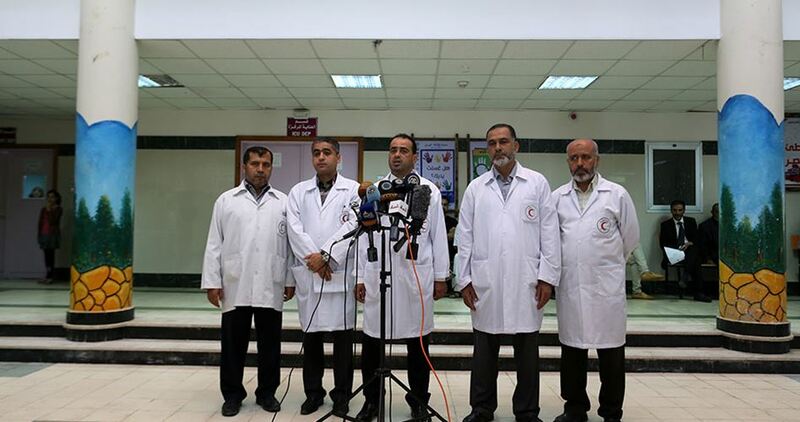 Medical staff at the European Hospital in Khan Yunis in the southern Gaza Strip staged a protest on Tuesday against the Palestinian Authority (PA) punitive measures which included forcing Health Ministry’s employees into early retirement and suspending patients’ medical referrals. European Hospital’s director Dr. Yousuf al-Aqqad said that the hospital departments will have to reduce their health services once the forced retirement decision comes into force, warning that this will negatively affect Gazan citizens. Aqqad added that they will try by all means to preserve employees’ rights and ensure the provision of health services to all citizens in a full and continuous process, noting that about 48% of Gaza’s Ministry of Health employees receive their salaries from the PA in Ramallah. He called on Palestinian factions and international health organizations to pressure the PA to stop the arbitrary measures waged against the health sector in the Gaza Strip. An Israeli court ordered Tuesday the eviction of the Shamasna family from their home in the Sheikh Jarrah neighborhood in occupied Jerusalem. Earlier on Monday, the court had refused an appeal submitted by the family against the eviction order which was issued several years ago. Speaking to the PIC reporter, Mohamed Shamasna expressed concern that the family house could be evicted at any moment. For his part, Hatem Abdel-Qader, a member of Fatah movement’s Revolutionary Council, considered the eviction order as a political decision par excellence which only serves Israeli settlers. Israelis have claimed that Sheikh Jarrah neighborhood was once the site of a 19th century Jewish community. Many families in the neighborhood have been embroiled in legal disputes for decades, as various Israeli settlers have attempted to claim ownership over their homes. According to the Israeli law, Jewish Israelis are permitted to claim ownership over property believed to have been owned by Jews before 1948 during Ottoman or British rule. However, such a law does not exist for the hundreds of thousands of Palestinian refugees who were displaced from their lands and homes during and after the establishment of the state of Israel. The Israeli Occupation Authorities (IOA) issued Tuesday a four-month administrative detention order against the leader in Hamas Movement Shaker Amara. Family members quoted the lawyer as affirming that Amara was held in administrative detention for four “renewable” months. 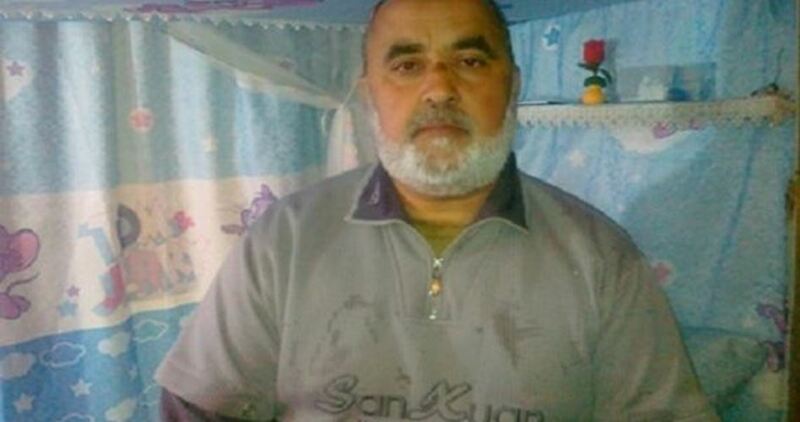 Amara, 55, was arrested on July 23 from his house in Aqbat Jabr refugee camp near Jericho during an Israeli large-scale raid and arrest campaign. A court hearing is scheduled to be held in the coming days to endorse the administrative detention order, the sources added. 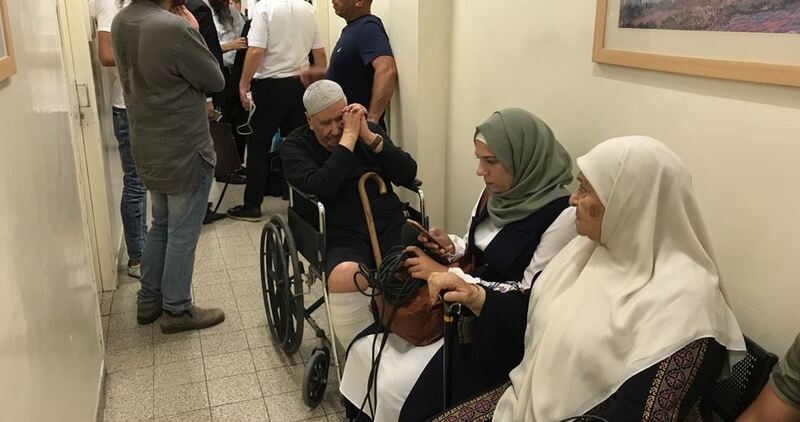 The family pointed out that Amara, who spent more than 11 years in Israeli jails in separate arrests, suffers a number of health problems and needs special health care. A practice dating back to the British Mandate, the decision to hold a prisoner in administrative detention is issued by the military commander based on a secret file. Both the lawyer and the detainee are not allowed to know the content of this file. Since 1967, around 800,000 Palestinians have been arrested. In March 2017, the number of Palestinian prisoners in Israeli jails reached 6,300, including 500 administrative detainees, according to Addameer, the Prisoner Support and Human Rights Association. The Israeli police forces stormed, along with a number of military bulldozers, Wadi al-Naam town in Negev on Tuesday and demolished two Bedouin homes before razing a nearby agricultural land. A nearby agricultural land in Khashm Zana village was also razed during the raid, he added. Last year, more than 1,000 Palestinian houses were demolished in the Negev under the same Israeli pretext. Nearly 50 Bedouin villages in the Negev are not recognized by Israel and have been targeted with demolition in preparation for building Jewish-only towns.